With the help of Dutch research institute Deltares, the Belgian contractor Jan De Nul investigated hydrodynamic loads on their gravity-based foundations (GBFs) for the offshore high voltage substations for the Kriegers Flak offshore windfarm in the Baltic Sea. The objective was to ensure safe yet economic design. For gravity-based structures at shallow and intermediate waters, wave slamming may cause high loads, which potentially lead to geotechnical instability. It is difficult to mitigate this risk due to the unique design of the gravity-based foundations and the complicated physics involved in wave breaking. CFD computation of a breaking wave on the second Kriegers Flak offshore substation. 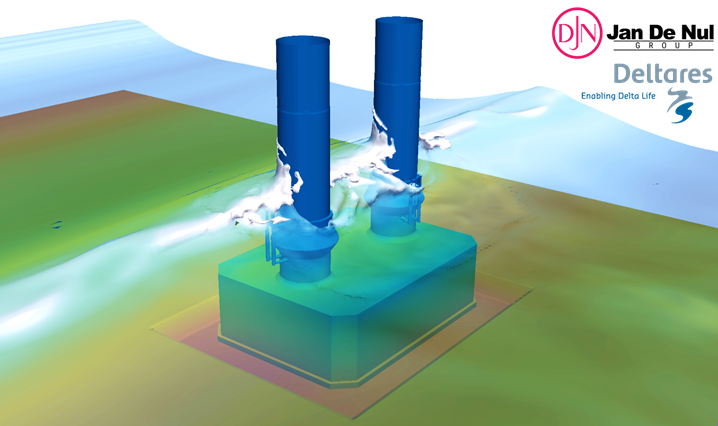 The advanced CFD models applied by Deltares consist of a two-step approach. In step one, more than 10.000 storm waves are analysed using a fully nonlinear wave model. This provides sufficient information for understanding the site-specific waves and for determining what a realistic breaking wave looks like. In the second step, the identified extreme waves are used as boundary conditions for a detailed CFD model, where loads on the structure are computed. The methodology was originally developed at the Technical University of Denmark and has been used in design of several offshore structures. Its main advantage is for complicated cases where standard design guidelines are not accurate, such as impacts on platforms due to wave run-up or slamming loads on gravity-based structures. “The advantage of this methodology is that the slamming waves have a size and shape that are realistic and representative of the specific site. By staying close to the physics, we get the most accurate results.“ said Dr. Niels Jacobsen, expert at Deltares. 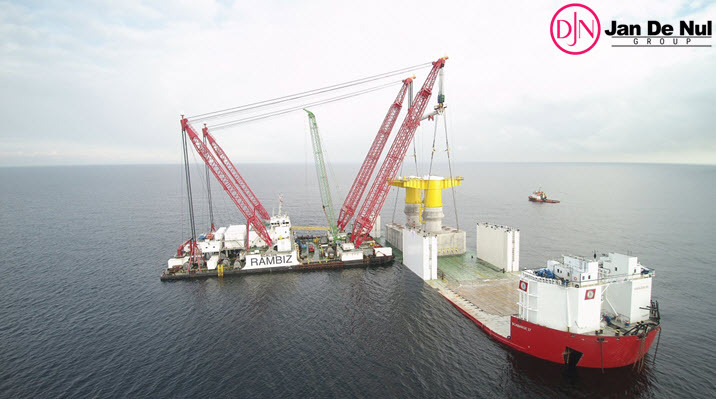 The gravity-based structures were successfully installed for the Danish wind farm Kriegers Flak in February 2018. The two gravity-based structures will support two substations, which will serving both the future Krieger Flaks offshore wind farm and an interconnector between the Danish and German power net. By 2022, Denmark’s to-date largest offshore wind farm will start generating CO2-free electricity for approx. 600,000 households. The interconnector project is funded by the European Energy Programme for Recovery.